Growbars are easy to grow, exciting seed collections, nestled in fertile coir bars, carefully created and packaged by a small team in the UK. A plastic-free and thoughtful gift, encourage novice green fingers, inspire experienced gardeners and are a fun family project. Looks like a large bar of chocolate! A plastic-free and thoughtful gift, encourage novice green fingers, inspire experienced gardeners and are a fun family project. Embedded in neat coir bars, these cleverly curated collections of seeds will thrive even if space or horticultural knowledge is limited. All that’s needed is a small container, some water and a warm, sunny spot on the windowsill. Within 6-8 weeks seedlings will be ready to plant into the ground or into pots. 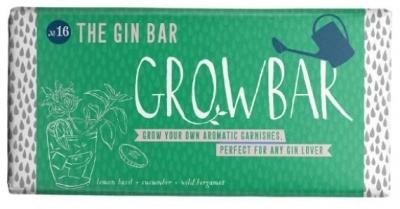 Each Growbar is 100% eco-friendly and they are carefully made and beautifully packaged, like a large bar of chocolate. The packaging is 100% biodegradable, made of recyclable card and a compostable film wrap made from biodegradable sugar cane and natural coconut fibre. 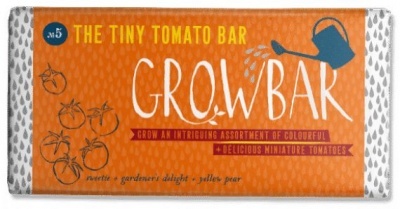 Tomato - Sweetie, Gardener's Delight, Yellow Pear - Grow a beautiful collection of miniature sun-ripened tomatoes right from the vine. Bee - Hyssop, Verbena, Lavender - These fragrant and beautiful blooms will bring bees buzzing into the garden. project. 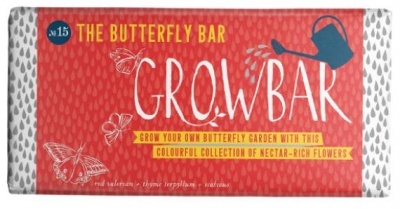 Butterfly - Red Valerian, Thyme Serpyllum, Scabious - Grow beautiful butterfly-friendly flowers to fill your garden with spectacular displays of nectar-rich crimson and purple blooms. 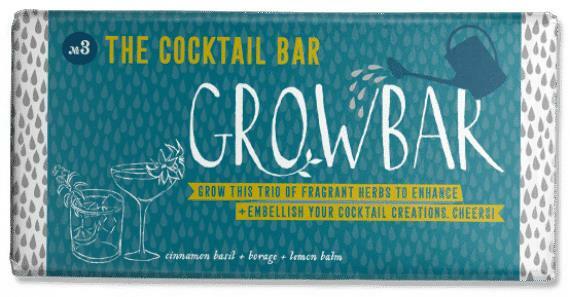 Gin Bar - Lemon basil, Wild Bergamot, Cucumber - Create perfect gin-based cocktails with this trio of aromatic garnishes. 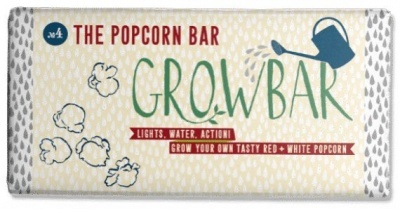 Popcorn - Yellow Corn, Red Corn - Grow impressive towering stems of corn, which can be simply dried and popped into the most addictive snack known to man. 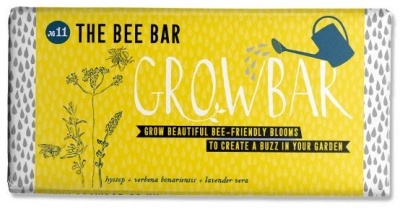 Start by unwrapping your Growbar and place it with the brown protective paper facing upwards, into a container with plenty of space to allow it to expand. Gently pour half a litre of water into the tray and position indoors on a warm, bright sunny windowsill. The seeds will need to be a cosy 22° to germinate.